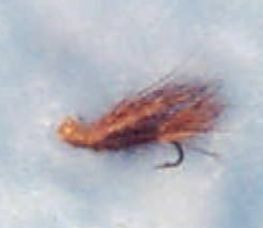 This technique is used for late summer run fish that are more active. The fish need to be undisturbed to come up to the fly. Early morning or late in the evening are the best time for this presentation. The presentation is a quartering down stream cast with a floating line and a dressed wake fly. As the fly comes across the current it makes a wake from the water pressure just under the surface. When a half hitch is put around the right point on the front of the fly it wobbles as it comes across the hole. The fly has a stiff overhead in front of the head or stiff forward hair wings that create the action on the fly. The fly is presented under pressure from the current during the drift. Check the action of your fly where you can see it by adjusting the half hitch position to get the action you want on the fly. Action can be enhanced by twitching the tip of your fly rod or by hand twitching the line. Don't set the hook until the fish has turned on the fly. In other words give the old "one alligator" set. With a sharp hook the fish will almost hook itself on the tight line.